There is not a girl in the world who wouldn't wish to sleep on a canopy bed in her very own kingdom of pink. And, truth be told, this is one of the very first interior design request little girls will have for their mothers and fathers. The good news for parents is that they don’t need an enormous budget to make those rosy fantasies come to life — crowns, canopies, and pastels and all. So, for moms and dads who are at a lost on where to start, homify is here to help. Here, we list down some great ideas to get you started with this fairy tale project. 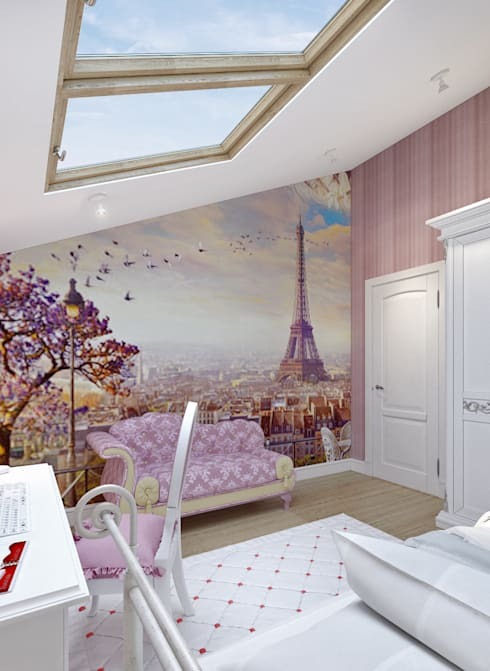 While a princess bedroom is all about fairy tales, get your daughter in a consistently excited mood for the realities of studying and doing homework by adding a beautifully-designed study nook. A crisp, white vertical bookshelf creates a beautiful contrast with the pink walls, making it visually stand out from the other parts of the room. That spine book tower is a smart option for a girl's room since it takes up less space! 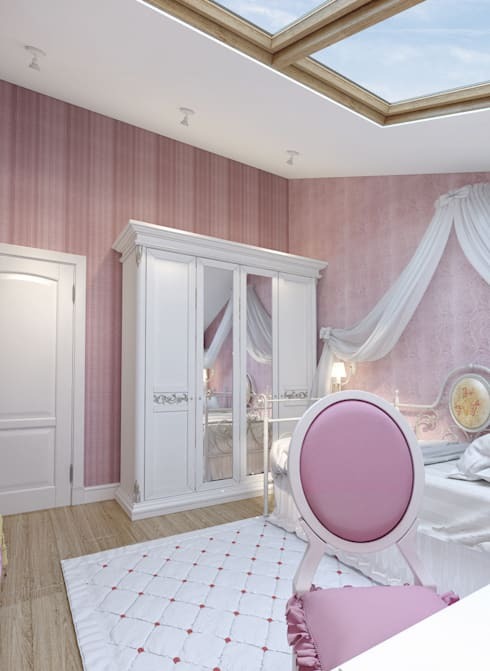 Add a sophisticated touch to your little princess's bedroom by incorporating a vintage-inspired bed, which you can pair with pastel or white-colored bedsheets. Finish it off with a bed crown by pinning long fabrics on top and the sides. Bedside lamps are also a great way to bring a touch of elegance to the room. It is also a good idea to make room for a playtime spot, where your daughter can play with her toys or even invite friends for a hangout, like this photo. To achieve this, incorporate fun, graphic patterns from the wallpaper to create an artistic vibe. Sprinkle a magical touch by adding a pink chaise long chair to complete the theme. This hangout is great to inspire playfulness and creativity for your little girl. 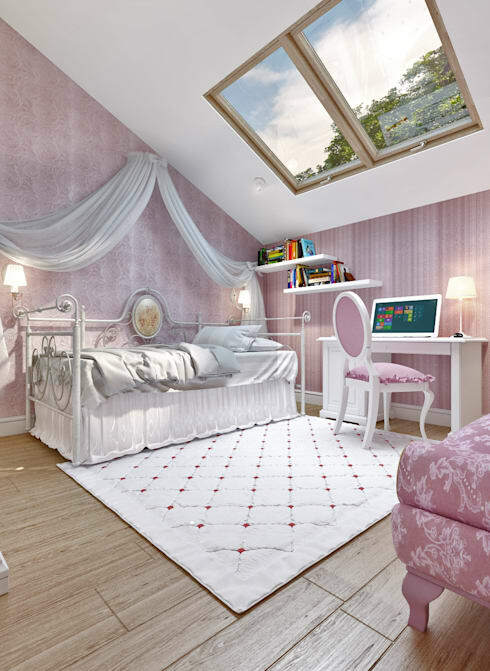 While some parents would be tempted to spoil their kids with an all-pink bedroom. It would be a wiser invested to keep all classic furniture in safe colors that stand the test of time. That way, your daughter would still be able to keep and use it in case she grows up and moves on to more mature interests. This simple wardrobe in the photo brings just that type of look with it's classic design and bright painted finish. Conjure a tasteful, design throughout by keeping things simple and minimalistic. Don't overdo the girliness! Instead, add a bit of other hues, especially white, which works well with pink. Pink and white make for the perfect princess combination as shown in the photo. Meanwhile, the white iron bed provides the bedroom with a dreamy appearance and a girly touch. Using furniture and accessories featuring curvy lines bring a feminine quality to the room. Lastly, make sure to add big windows to let the soft, natural light flowing.